Even before the release of preview footage, with only a handful of promotional images and a very short description, I knew Tamako Market (たまこまーけっと), created and produced by Kyoto Animation (京都アニメーション), was something I would want to give special attention. At the end of 2012, I had been writing about urbanism in anime for about half a year, and had just returned from my first serious street photography session in Tokyo. 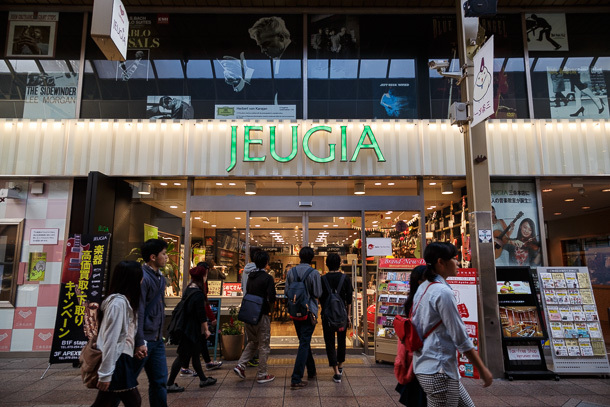 As I worked through the photos and began writing articles, I was beginning to understand the various permutations of shōtengai—open and covered shopping arcades—and their role in urban design and community life in Japan. A broadcast anime series about a girl growing up in a shōtengai seemed tailor-made for the connections I was trying to make. I had already begun to understand some of the dynamics of the anime pop culture tourism community, seichijunrei (聖地巡礼 holy land pilgrimage) at the casual end of the spectrum, and butaitanbou (舞台探訪 scene hunting) as known to its core practitioners. The popularity of Kyoto Animation works among these groups, combined with the ease of access to Kyoto based location models used for Tamako Market, opened the floodgates of activity and the information stream coming out of it. Tamako Market aired late at night, Japan time. While fans of late night anime are increasingly time shifting shows with digital video recorders, many stayed up specifically to see and comment on Tamako Market as it aired. I was on New York time then, so I could follow this in real time during my afternoons. I would see the second wave of comments from people who woke early to watch the recording before work, as I was getting ready for bed. I would catch the busy evening discussion, which frequently included offline meetings, while eating breakfast. Among the many participants, one voice stood out. While most were fixated with on identifying the locations as they appeared in the show, one person engaged them with unhurried confidence, seeming to have a sixth sense as to what was happening and offering helpful suggestions. Sometimes he visited the Demachi Masugata Shōtengai (出町桝形商店街), the model for the show’s main setting, to take photos and share with everyone. This was Moriwaki Kiyotaka (森脇清隆), the Senior Curator of the Kyoto Film Archive, part of The Museum of Kyoto (京都文化博物館). In his main role, he is the custodian of Kyoto’s rich history of live action film making, but during and subsequent to the Tamako Market broadcast, it was clear that he also supported and was quite knowledgeable about the output of small, relatively young but influential studio Kyoto Animation. In the middle of the Tamako Market broadcast season, a TV news program covered the influx of pop culture tourism at Masugata and featured Moriwaki as its primary interview subject. When the museum theater held a re-screening of the K-On! film, Moriwaki promoted the showing, as well as participating in what became a blended Tamako Market and K-On! online discussion. From this, it became clear that the two shows, both by Kyoto Animation and both based on Kyoto locations, stirred up similar kinds of enthusiasm and engagement among the groups I was observing. At this point, it was clear that Moriwaki was not a newcomer to this discussion. I visited the Masugata Shōtengai in 2013 October, then published my research of place identity and consumer generated media regarding the arcade in 2014 April. This coincided with a special event at the museum, a screening of the entire 12 episode Tamako Market series, followed by a panel discussion with Kyoto Animation staff, just as the film sequel Tamako Love Story (たまこラブストーリー) was about to premiere. Moriwaki was again the public face of this event, promoting it as it approached and sharing details as it happened. He also discovered and helped share my post, and we began communicating directly. When I asked questions about why he took an interest in Kyoto Animation and about the studio’s production process, I got very specific and detailed answers. Sometimes, one response would span multiple 140 character tweets, which is a lot of information in Japanese. Maybe it was my limited language capability, or the incomplete nature of information filtered through social media, but I was still missing a very important piece of the picture. The situation might have stayed that way, had it not been for my incredible luck to run into Moriwaki and his wife Motoko while on a walk through Masugata on my 2014 October return to Kyoto. After meeting them, I explain that I have come back to take more photos and am on my way to meet the core of the Kyoto butaitanbou community in person for the first time. I usually feel nervous to ask people for things that may inconvenience them, especially someone I’ve previously never met in person. However, thinking this is an opportunity too precious to let pass, I ask about his schedule during the few days I will be in town. We both have time on Tuesday, October 21 in the afternoon, later confirming over Twitter to meet at his office on the seventh floor of the museum. When I go to the museum for our meeting, I am in my last full day in Kyoto and nearing the end of my current trip to Japan. Moriwaki leads me to a spacious but quiet lounge area with large, low tables. I have my camera sling over my shoulder, laptop clutched in my arm. He brings his laptop and a large bag from the museum shop full of materials, which are both a gift for me and visual aids for our meeting. I have many thoughts in my mind from the places I have been and people I have met, but beyond a shared interest in Kyoto Animation and cameras I am not sure what direction our conversation will go. I think we both had faith that we would figure it out when we got to it. What a treat was I in for. Our conversation was almost entirely in Japanese, with bits of English here and there as needed. Moriwaki also typed out sentences in Google Translate when he wanted to make sure I understood most of what he was saying, or at least a machine translation of it. Since he typed quite a lot, then graciously added more explanation and emailed it to me later, I have been able to cross reference that with my own notes. Even with all of that, my grasp of Japanese, especially with regard to complicated topics, is still tenuous. The remainder of this post is a good faith effort to relay and explain what we talked about, and if I later learn that I have mistranslated or misunderstood something I will update the article and note the corrections at the bottom. We spread all of our items out across the table and start at the beginning. Not Tamako or Kyoto Animation’s, but the 794 AD establishment of Heian-kyō as the capital of Japan. Though the seat of power periodically shifted to and returned from other places, eventually moving permanently to Tokyo in 1869 along with transfer of official capital city status, in its over 1,200 years of history, Kyoto has widely been regarded as the creation center of many important cultural properties, and is still considered the custodian of traditional Japanese design philosophy and aesthetics. The English name of Moriwaki’s employer drops the important specifier 文化 (culture), which differentiates it from other museums in the city. Where the others have more general aims and collect an assortment of fine art works from across Japan and the world, the express purpose of The Museum of Kyoto is to document, preserve and facilitate new learning based on the specific art, culture and history of the city. So, what is this culture? I would guess that you might get as many different answers as people you ask, but for Moriwaki it comes down to the relationship between utility and art, and in how Kyoto artisans choose to combine them, rather than tradeoff one for the other. The first example he gives is a cup. Its function is simple, it need only to hold liquid. A cup can be made without any creative embellishments. But in the hands of Kyoto potters, chawan used in a tea ceremony become small works of art. The function of clothing is to cover the body and provide some warmth and protection, but kimono weavers use textiles as a medium for sophisticated creative expression, and Kyoto remains the center of manufacturing. He extends the comparison into anime. In contemporary animation in Japan, there is no shortage of female characters with ample chests. (As he says this, the statement is accompanied by helpful pantomime.) There is a market for this, and many creators and production committees respond accordingly. This is utility anime. The trope is so overused that it frequently spills into many shows not created intentionally to titillate. Moriwaki points to a female character on the cover of a book he has given me. I recognize her as Hidaka Yumemi, the lead female character of Munto, the very first work for which Kyoto Animation was the creator and main producer. This character is also meant to be attractive, but the drawing is elegant. This is Kyoto style. It is interesting that Yumemi makes it onto the cover. 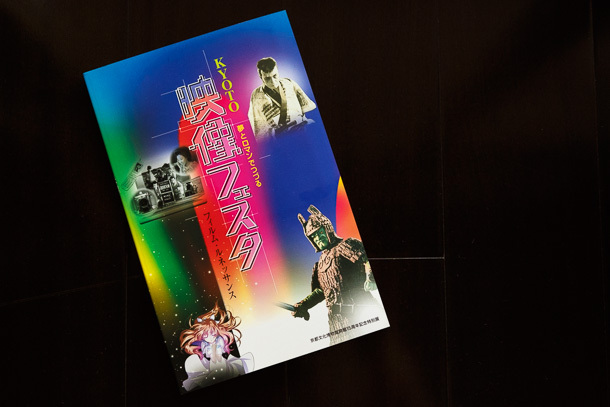 The book, Kyoto Eizō Fesuta (KYOTO映像フェスタ), a report on the history of film making in Kyoto, was published by the museum in 2003 October. At the time, Kyoto Animation was relatively unknown to the general public. Munto was released direct to the web in 2003 March. Prior to this, the studio had provided animation support for shows headed by larger studios, InuYasha probably being the most well-known in and outside Japan. Between 2003 and 2005, Kyoto Animation released its first three broadcast series as the main producer: Full Metal Panic? Fumoffu, Air and Full Metal Panic! The Second Raid. However, it was the launch of the anime adaptation of The Melancholy of Haruhi Suzumiya that was the studio’s big break and the beginning of what would become its characteristic animation style. The other images of film sets and actors in samurai costume are more representative of the contents of the book and of Moriwaki’s work. Kyoto once dominated the Japanese film industry, at one time accounting for 60 percent of production. It is most well known for jidaigeki (時代劇), which translates as period dramas, though it often means set in the Edo period, from 1603 to 1868. Though not limited only to samurai films, these are probably the most well known of the type, due to the popularity of the sub-genre. For those into Star Wars trivia, it was the sound of this word jidaigeki that gave George Lucas the idea for the name Jedi. The Kyoto Filmmakers Lab, in which The Museum of Kyoto is a partner, is an annual workshop and training session for young filmmakers to learn the production techniques of jidaigeki. As demand for this aesthetic waned, so the market share of Kyoto’s film industry declined, though it is interesting that the style continues on in animated form with popular shows like Gintama. After some collective reverie, we focus on Kyoto Animation. Moriwaki and I agree that, for anyone with more than passing knowledge of film making techniques, there is a lot to appreciate in the studio’s output. Even before I had begun communicating with him, I had picked up on many things that differentiated it. The use of jump cuts, where the action abruptly shifts forward a few moments in time while the camera moves a few degrees, is not a byproduct of cut-rate animation but a deliberate, creative editing choice as pioneered by director Jean-Luc Godard. There is selective focus of elements within a scene, mimicking the shallow depth of field of a wide aperture lens, and rack focusing, where the shallow plane of focus moves during a shot. Animated parallax simulates the effect of a camera moving parallel to the plane of focus in a dolly shot. It is clear that the studio’s animation directors are intimately familiar with the technical and creative operation of camera gear. Moriwaki mentions that Kyoto Animation prides itself on use of lighting, using natural phenomenon like golden hour to maximum effect. I add that not just light, but light reflected on water, as in the scenes of Lake Biwa in Chūnibyō demo Koi ga Shitai!, really showcases the quality that goes into each work. Light reflections on water are hard enough with the aid of computers, a comprehensive stress test of an animator’s abilities when done in hand-drawn animation. 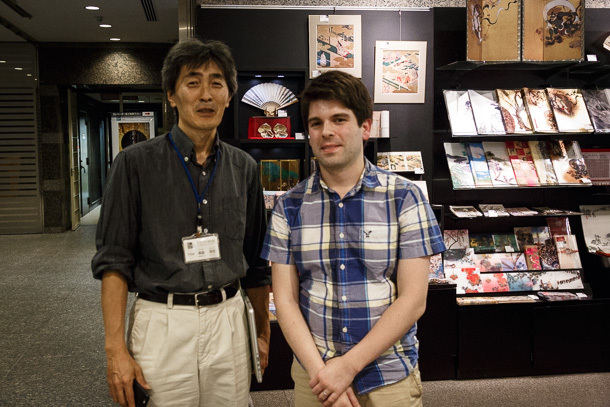 Moriwaki tells me of the relationship between Kyoto Animation and The Museum of Kyoto. During a special exhibition, the studio once operated out of facilities at the museum for six weeks while it was still an up-and-coming player in the animation industry. Staff setup in the exhibition space demonstrated the animation and sound recording processes for original works in production at that time. As he is talking about this, he begins searching through folders on his computer and queuing up some drawings and photos. I recognize one as Demachi Futaba (出町ふたば), the traditional sweets maker, most notably of glutinous rice cakes called mochi, near the Masugata Shōtengai. Demachi Futaba contributed greatly to the visuals and story elements of Tamako Market. Moriwaki tells me that museum researchers assisted Kyoto Animation during the scenario hunting (シナリオ・ハンティング) or location hunting (ロケーション・ハンティング) phase of Tamako Market. In this stage of production, the animation team chooses real world locations that will be used as visual models for a work’s setting, and that often contribute ideas to plot development. Moriwaki supervised this work. This is when it hits me that, after poring over the minutiae of this particular show and its location model for almost two years, I now have a private audience with someone who was at the center of putting all of it together. Not only that, but he has the breadth of knowledge and experience to frame this information in the broader context of the life of Kyoto Animation, of moving image creative works, and of Kyoto art, history and culture in general. Sometimes the universe works in unexpected ways. He tells me that at the earliest stage of the planning process, the slot that eventually became Tamako Market was originally intended for a possible K-On! season three. It was director Yamada Naoko (山田尚子) who pushed for a break from the highly successful franchise in favor of an original work. Her vision for the primary setting was to showcase a small but healthy and lively neighborhood shopping arcade. The first candidate location in Kyoto was ultimately passed over for the Demachi Masugata Shōtengai. I ask Moriwaki if he could tell me which was the first shōtengai. Himitsu (secret). I beg. Himitsu. This is common practice in the industry with regard to work products that do not become part of the final concept. Kyoto Animation’s secrets are safe with Moriwaki. He shows me an early character design of Kitashirakawa Tamako. In this version, Tama-chan does not yet have the mochi-shaped hair accessories. Those came later, after the concept of the daughter of a mochi maker had firmly been established. From Demachi Futaba, the feel of the small, family run business offering high-quality but very traditional fare, is the basis for the Kitashirakawa shop. Even Futaba’s signature mame-mochi becomes the featured item made at Tama-ya. Because of this, as well as its location just outside Masugata, Futaba tends to receive much of the attention from pop culture tourism. However, a second shop, Yōrōken (養老軒) on the west side of the city, also figures heavily into the scenario. Where Demachi Futaba is by-the-book, Yōrōken offers a modern take on mochi, featuring unusual fruit-based fillings and chic designs. The two mochi makers are often pitted in friendly competition, which becomes the frequent but good-natured fighting between Mamedai of Tama-ya and Gohei of Ōji-ya/Ricecake Oh! Zee, with its irreverent offerings across the street. The Demachi Futaba staff gave the researchers a thorough history of mochi making and explanation of the techniques used in production. The kitchen layout and equipment at Yōrōken is used as the model for the interior of Tama-ya. In the arcade, florist Hana no Harukaze (花の春風) becomes Florist Princess. Shop staff explained that stock is shipped in refrigerated carriers and arrives to the store cold. This information led to the creation of the scene where the bird Dera is accidentally stuffed into cold packaging and shipped to the shōtengai. We browse through photos of Seibo Jogakuin (聖母女学院), used as the visual model for the school. 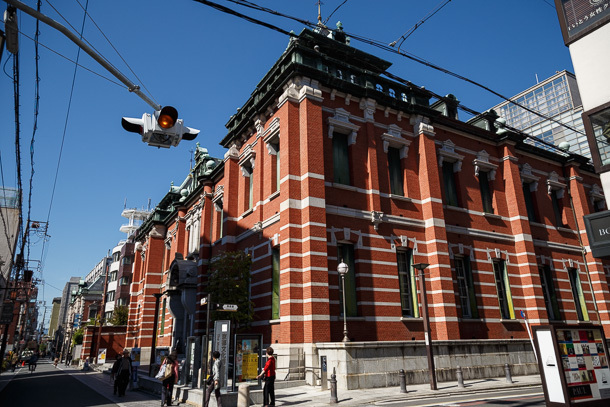 I remember after the first episode, when it hadn’t yet appeared beyond a small piece of red brick facade in the ending credits, viewers mistook the school’s main building for The Museum of Kyoto Annex, formerly the Kyoto branch of the Bank of Japan (photo at top). The public bath house Nishiki-yu (錦湯), which is in downtown Kyoto, is imported in whole as Usa-yu. The look and feel of the Kyoto institution is more or less unchanged from its opening in 1927. The location hunting photos even include the boilers and other inner workings of the bath. Though these didn’t become part of the Tamako Market art, imagery of the boiler exhaust stack shows up in the ending credits of the first season of Chūnibyō demo Koi ga Shitai! The main course of our conversation is the Demachi Masugata Shōtengai, known as the Usagiyama Shōtengai in the Tamako Market universe. Moriwaki walks me thorough the entire development of the scenario, from the perspective of both Kyoto Animation and shōtengai management. Apparently, when animators and researchers first began visiting Masugata, shōtengai president Inoue Atsushi (井上淳) mistook them for animation students. Inoue was surprised to eventually learn that Kyoto Animation was considering the use of Masugata as a location model and that the main character was to be the daughter of one of the shop families. Even at that point, Inoue was still not aware of the pop culture tourism phenomena this would induce. Moriwaki explained to Inoue that when an animation studio, particularly Kyoto Animation, chooses a location as the model for a work’s setting, that location will become regarded as a seichi (聖地 holy land) in the eyes of fans. This would result in a significant increase in the number of visitors to the arcade in the short term of the broadcast season and, depending on the show’s popularity, for some time thereafter. Prior to the broadcast, Moriwaki and shōtengai management convened a meeting to discuss actions the arcade might take in light of its relationship with the show. Moriwaki describes the large arc of the conversation, which shifted from initial short-term, transactional-based thinking to a reaffirmation of Masugata’s value proposition and long-term strategy. At the beginning, people from the arcade asserted their belief that to use Tamako Market as a means for promoting Masugata would not go against their policies and norms. Thus, their initial questions were concerned with what the nature of a campaign to sell more products in the arcade would be. At one point, Inoue asked if Masugata could purchase the rights to use Tamako Market images. Moriwaki explained to Inoue that Kyoto Animation does not casually grant rights to use of its intellectual property, and that Masugata would not be able to use it for marketing and sales. It was understandable that Masugata would make this kind of inquiry, as at the time it held a contract for exclusive use of the regional promotion character Kamogawa Makoto (加茂川マコト). Moriwaki helped Inoue to understand that, where Makoto was created with public money for the express purposes of this kind of usage, Tamako came from private money and Kyoto Animation’s control over the use of its characters is a crucial aspect of its business. The rights question was cut-and-dried, but ultimately secondary to the bigger issues at hand. 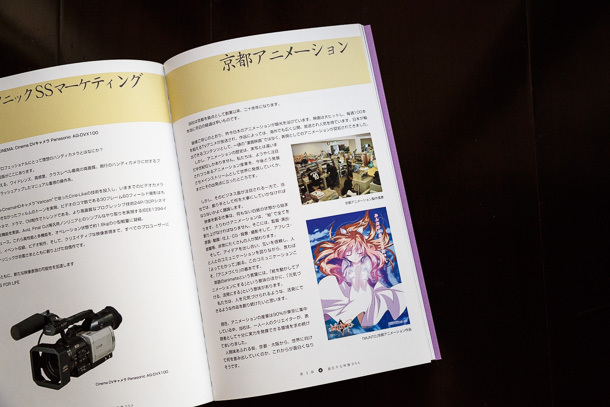 Through their conversation, Moriwaki was able to help the shōtengai management see that their best course of action would be to continue to promote the arcade on its own merits and strengths, the very things for which Kyoto Animation chose it. For the more than 50 years that Masugata had operated prior to that point, its merchants had worked hard to meet the needs of the local community and maintain open communications with it. At the arcade, there is a wide range of goods and services, with emphasis on high-quality foodstuffs and necessities for maintaining good health. When Kyoto Animation made its assessments, staff were struck by the wonderfully warm atmosphere. Their concept for Tamako Market became to showcase this environment in Masugata as they had found it, from the perspective of a fan of the shōtengai. As attractive as the marketing opportunity had seemed, Masugata began to understand the risks of suddenly pandering to anime fans. The local community would, at best, feel a little inconvenienced that space was being diverted to sales of goods targeting visitors. At a deeper level, to use its connection to Tamako Market to begin selling branded goods would seem to fly in the face of what Masugata means to its customers. To shift from being a trusted provider of daily needs to selling products based only on design risked a real loss of credibility. Furthermore, were Masugata to pander to anime fans in order to capitalize on sales opportunities, it would no longer be the place that it was when Kyoto Animation captured it. In recommitting to authenticity, the benefit to Masugata is that, even if in 50 years Tamako Market is forgotten, it should not have any impact on the shōtengai. Visiting Masugata now, one can see that the message was ultimately taken to heart. The printed Tamako Market t-shirts for sale at Self Kishimoto-ya (セルフ岸本屋) are the only anime related product for sale, the one concession Kyoto Animation made regarding use of character images. Several of the official marketing posters from the broadcast series and film sequel are displayed in the arcade. Beyond these, the only other imagery to be found are the fan art donations, such as the tobidashibōya (飛び出し坊や) of Choi, Dera and Tamako at the west entrance, the cup phones that hang from the arcade roof, and the drawings affixed to the wall in Inoue’s shop Sagaki (さが喜). Almost all of these gifts are handmade, not inconsistent with the relaxed and informal feel of the ink calligraphy on the banners for which the arcade is known. I think this may be the best possible outcome. None of these items particularly stands out, but if anime pilgrims are visiting Masugata in hopes of finding Tamako, they will find her in these subtle images, which represent the thanks of some of the arcade’s biggest fans. Moriwaki thinks that the decision by Masugata to continue as it was, preserving the nature of product offerings and environment even as it evolves as a business, is the best possible gift it could have given to the seichijunrei community. When anime fans come to visit, they will find the arcade in more or less the same state as its fictional counterpart. By choosing not to inundate the space with images from Tamako Market, Masugata demonstrates understanding that cherishing its unique environment was central to the vision of Kyoto Animation in the work it created. Moriwaki says that, as much fun as it was for him and museum staff to participate in the development of Tamako Market, another important role they played was that of translator and mediator between the Masugata Shōtengai and Kyoto Animation. These two businesses have such divergent aims and interests that, at times, it can seem as if they don’t even speak the same language. Considering how much the scenario is informed by interactions with people in the space, it is ultimately in Kyoto Animation’s interest to have a collaborative relationship with places like Masugata. Moriwaki and his team helped bridge the communication gaps between the two sides as needed. With Tamako Market out of the way, we transition to a higher-level discussion about modeling the real world to create sense-of-place in animation. Moriwaki imagines it must be much fun for young viewers to encounter their local neighborhoods embedded in the settings of shows they watch. Often, relatively unknown places with rich street culture and notable visuals come to be the basis for animated works because the creators have lived there. The presence of an interesting built environment is one factor but, more importantly, the creators must also understand the nature of the space, such how it is used by people and what kind of light will show it most attractively. To Moriwaki’s eyes, Kyoto drawn by artists living in Kyoto looks different than Kyoto drawn by those who do not. Before this meeting, we had begun trying to answer the question of why, when animators begin with a blank sheet of paper and are constrained only by what their minds can conjure up, do so many recent productions extensively model real places. We revisit the topic here in Kyoto and continue over email afterward. Moriwaki believes that, given realism of the setting is a design goal of these works, creating backgrounds purely from the mind will inevitably result in contradictions or inconsistencies (he uses the word 矛盾). The contradictions he has in mind are anachronistic inclusion of technologies, or landscapes that don’t appear plausible. But modeling does not just provide bounds for deciding what to exclude. Neighborhoods are complex, with variables such as topography, climate, local culture, subtle variations in colors, and the extent of deterioration of the built environment all interacting to create the essence of a place. The amount of information is so massive that animators, regardless of how imaginative they may be, would not be able to generate all of these to a sufficient extent in a fictional setting. Ultimately, the most effective way to draw a world that feels like a real place is, not too surprisingly, to use a real place. Referring both to the Masugata Shōtengai and location use in anime in general, Moriwaki says the relationship between creators and the people who provide or manage spaces can be a delicate one. Two questions often arise from the location supplier. One is whether the location may use the product of the animation studio for its own purposes, as was the case in Masugata. Sometimes, there is even discussion as to whether the studio should provide monetary compensation to the location, and how that value would be calculated. Moriwaki thinks this is attributable to the general perception of anime as a low-culture or sub-culture art form. To illustrate the point, he describes a hypothetical scenario in which Picasso were to come to Kyoto and paint a scene of the Masugata Shōtengai. Because of Picasso’s status as a creator of high-culture fine art, there would be no argument that Masugata could neither use the finished painting, nor charge money for the use of the scenery. When locations appear in anime, there is often misperception that the creative output should be more easily obtained for use by the places on which it is based. Moriwaki feels this thinking indicates shallow understanding of the full-breadth of arts and culture in Japan. At first glance, recent campaigns like Cool Japan seem to suggest domestic pride in pop culture media like anime. However, Moriwaki thinks the reality may be more that Japan’s Ministry of Economy, Trade and Industry sees the perception of high value by foreigners as a market opportunity, and the campaigns do not reflect sincere respect for anime as art. Moriwaki asks why I have taken an interest in Japan’s shōtengai, which face many challenges to continued existence. Even those not under threat of disappearing through urban redevelopment must still find ways to compete with supermarkets, big box retail and online sales. I briefly explain the last mile/kilometer problem that limits opportunities for transit-oriented development in suburban areas in much of North America, as well as China, which seems determined to repeat many of the same urbanization mistakes. Generally, the difficulty of reaching a final destination on foot from a transit node reduces the practicality of public transportation, promoting dependence on car use, leading to more surface parking, which inefficiently utilizes land that could be used to develop higher density commercial areas surrounding the node. The lower the density of the entire region, the more likely for the problem to occur. Shōtengai seem to fill the role of a bulwark against this pattern. Most often, they consist of a very high density of commercial activity on a single street, or a web of connected streets, adjacent to or in the vicinity of a transit node. It is a visible commitment to a focused approached to development, which encourages other businesses to stay close and take advantage of the cluster effect. There may still be a fair amount of walking required to reach residential areas beyond a small radius, but a 500 meter walk that includes a shōtengai filled with daily needs and amenities is a very different experience than one along a barren, arterial road. In the United States, there is a recent trend of moving back to more urbanized areas, with denser, more walkable neighborhoods and access to public transportation, particularly among younger generations. As planners develop strategies to meet changing market demands and population growth, I would like to help them be aware of preexisting development models that can save them from recreating everything from scratch. Many of the concepts presented as new thinking under the banner of labels like placemaking have long been part of Japan’s machizukuri (街づくり) tradition. We begin comparing public space in Japan with forms found in China. In Hong Kong, the vertical dimension is often the most interesting. With limited surface area and challenging topography, it has developed as an intricate network of layered spaces, public and privately owned. I don’t have many nice things to say about Beijing, where I live currently. Though the old neighborhoods are fascinating, they are rapidly being destroyed and replaced by megablock development. I draw a picture in my notebook to illustrate the one square kilometer sized lots with little to no permeability through them. Each one is often bordered by cold, blank walls with a few gates for cars and people to enter. Adjacent megablock patches are separated by massive arterial roads, some as many as eight or ten lanes. Moriwaki asks why it is this way. I am not an authority on the topic, but one theory I have read is that modern Beijing’s layout was heavily influenced by contributions of Soviet planners working with and educating their Chinese counterparts during the collaborations the two countries often engaged in before relations soured. Marxism tends to view urbanization as a means by which to develop productive forces and dissolve the hierarchies of traditional communities. The city is a factory or machine, not a habitat to meet the social and spiritual needs of humans. Though there are many reasons why Beijing now looks the way it does, some believe the hangover from this initial stage of communist China continues to haunt the capital. Fortunately, I find Shanghai, where I’ll be moving at the end of 2014, to be far more fertile as a base for exploring China’s street culture, at least in the old part of the city. Moriwaki looks at my Beijing grid diagram again and ponders it for a moment before asking, “Isn’t Kyoto just like this?” It is true that Heian-kyō, which makes up the bulk of the core of modern Kyoto, was just one big grid. Interestingly, the original city plan was a replica of ancient Chinese capital Chang’an, modern day Xi’an. But even before daimyo Toyotomi Hideyoshi doubled the number of north-south streets by dividing the blocks in half, the scale was nowhere near what we find in Beijing. In Heian-kyō, a cho (町), akin to a block, was exactly 121.2 meters on each side. Streets were between 12 and 24 meters wide, narrowing as the city developed. I take my drawing and fill in the megablock with vertical and horizontal lines. This is Kyoto! Recalling what originally brought us together, Moriwaki brings up butaitanbou. He points out that, for all the time I spend observing and interacting with that sub-culture, I don’t actually take those kinds of photos. He’s referring to the practice of documenting anime backgrounds, then visiting the real location, taking photos that precisely match the perspective, focal length and crop as they were rendered in the work. I explain that, though I do enjoy following their work as an anime fan, it is actually the skills they develop as byproducts that I am trying to connect to my other interest areas. Specifically, I want to understand the competencies that are useful in facilitating non-expert engagement with urban development. The content of butaitanbou articles, such as photos, maps and written descriptions of the built environment and sense-of-place, overlaps significantly with that used by people who document and analyze urbanization. Moriwaki asks what I have planned for my next projects. Fortunately, I have been selecting highlights from my trip among my photo batches each night and doing quick color correction, so I am able to show him what will eventually end up as new articles on my site. I go quickly through the first week of photos from Tokyo, though he stops me at a picture of a ramen shop kitchen. This is when I remember that, like me, Moriwaki is a big ramen fan. He recognizes the logo as Muteppō (無鉄砲), but flashes a look of concern when I clarify that it is the branch in Nakano Ward, Tokyo. He checks to make sure I know that the honten (original shop) is in Kyoto Prefecture. He insists the Tokyo version couldn’t possibly be the same, and recommends we make a trek out to the honten the next time I’m in town. I get to the Kyoto and Osaka photos, many of which are familiar locations for him. He lights up when I land on a shot of JEUGIA, in a shōtengai just down the street from us, launching into an aside about how the music shop became a location model for K-On! Unfortunately, I wasn’t able to commit the details to memory, but will try to get the whole story when I have the chance. It is only when I ask him about dinner and Moriwaki says he must stay after hours to supervise film projector maintenance that I realize we have talked for two and a half hours. It has been a wonderful and unexpected event, and I’m not able to adequately express in Japanese or English how much I have enjoyed it. In addition to his time and thoughts, he gives me one final gift as I’m getting ready to leave. He won’t hear of me going to Hakata-Nagahama ramen shop Miyoshi on Kiyamachi-dōri, which admittedly is very no frills, though always comforting and satisfying. Utility ramen, as it were. Instead, I have to try his personal recommendation, tonkotsu ramen shop Takakura Nijō (高倉二条), about a ten minute walk from the museum. It would prove to be a good change of plan. As we collect our things, I try my luck one final time, asking if he could tell me the location model for the next Kyoto Animation work in the pipeline.